Today things finally really began happening on our long-awaited island house. 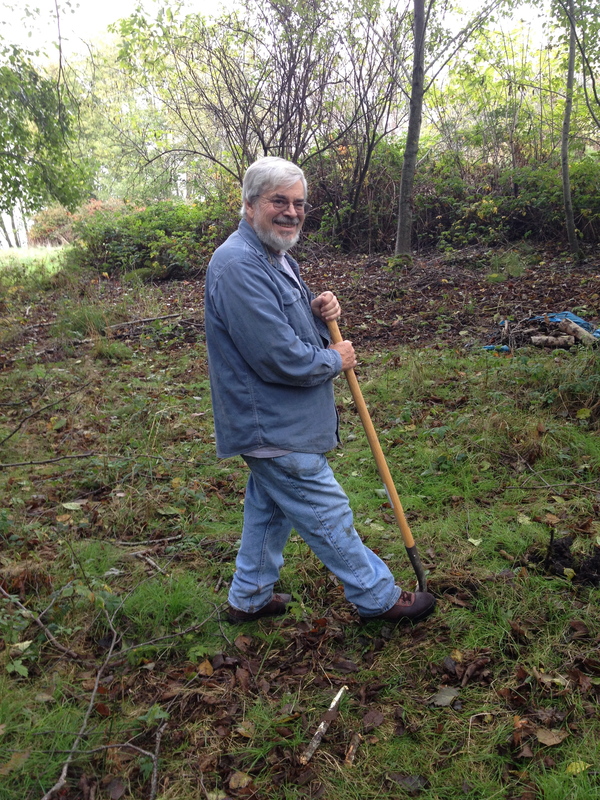 We had actual work being done on the property. 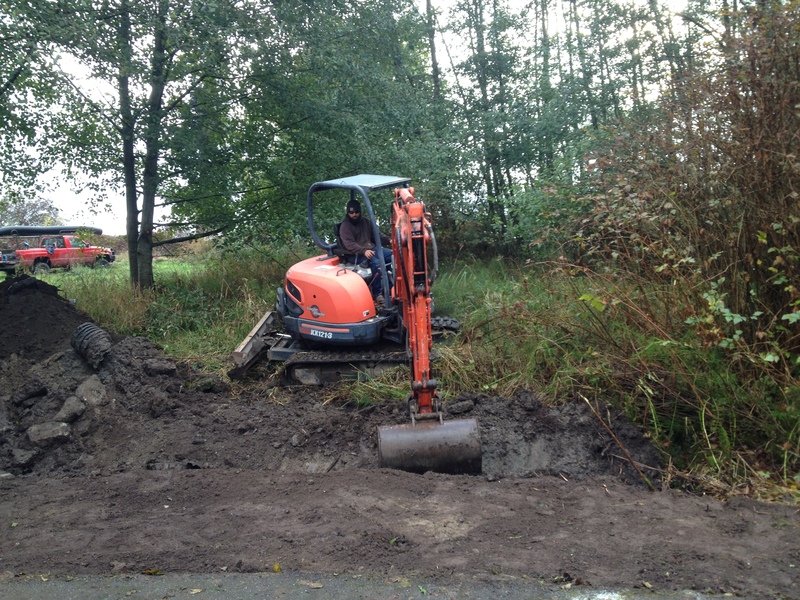 Our contractor replaced a culvert, something that was required by the county before it would issue the building permit. It was very exciting to see actual work involving digging with heavy equipment taking place on our land. They dug out the old culvert, along with a lot of broken concrete, placed a nice new plastic tube, and then brought in a load of gravel to cover everything. The whole process took only about two hours, and when it was finished we had a real entrance to the property. 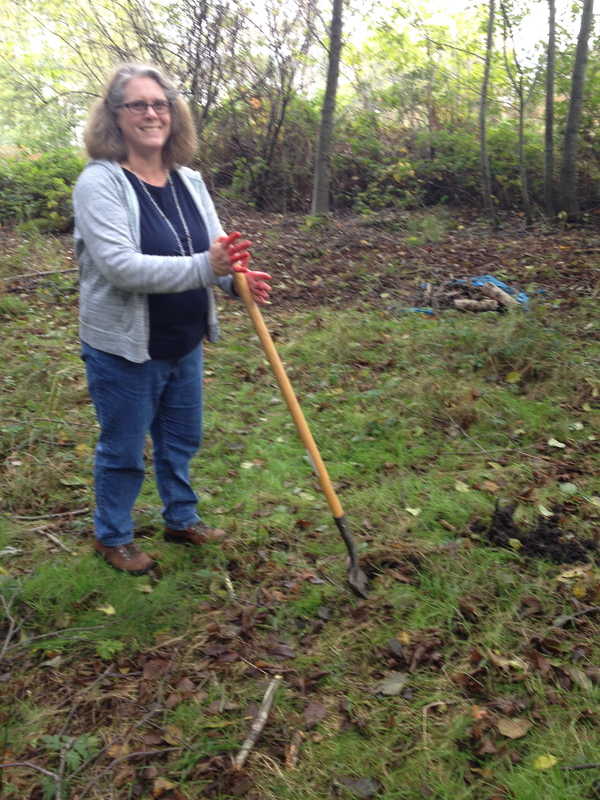 After the culvert work was done, Robin and I went up into the woods and had a little ground-breaking ceremony. 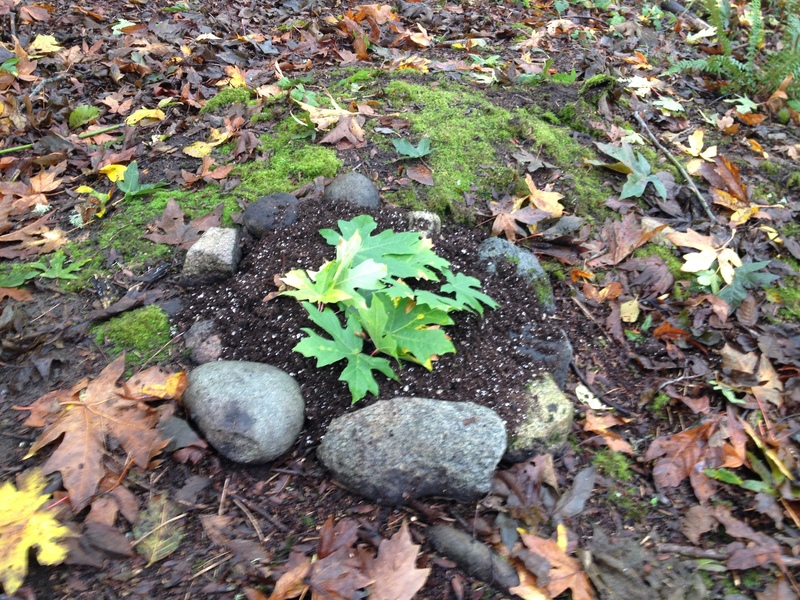 Following Feng Shui rituals, Robin made a small garden under our big maple tree with rocks, soil and leaves. It is supposed to be a wildflower garden but the woods are too shady for wildflowers. 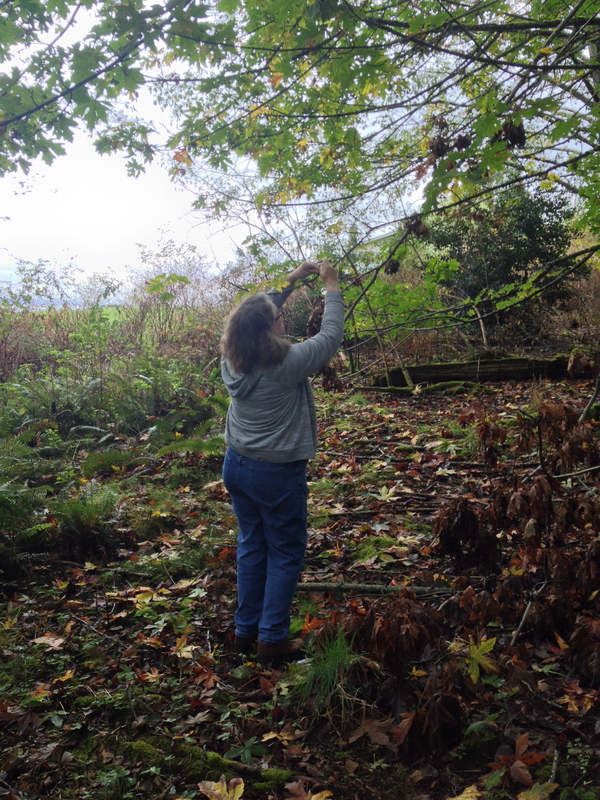 She also hung crystals from some of the trees. Then she mixed up a concoction of Chinese rice, cinnabar, saltpeter, and rum and, with much chanting, scattered the rice to the north, south, east, and west, and near where the front door of the house will be. After that we turned a shovelful of dirt to break ground. Our contractor expects to pick up the building permit tomorrow, 14 weeks after we applied for it. 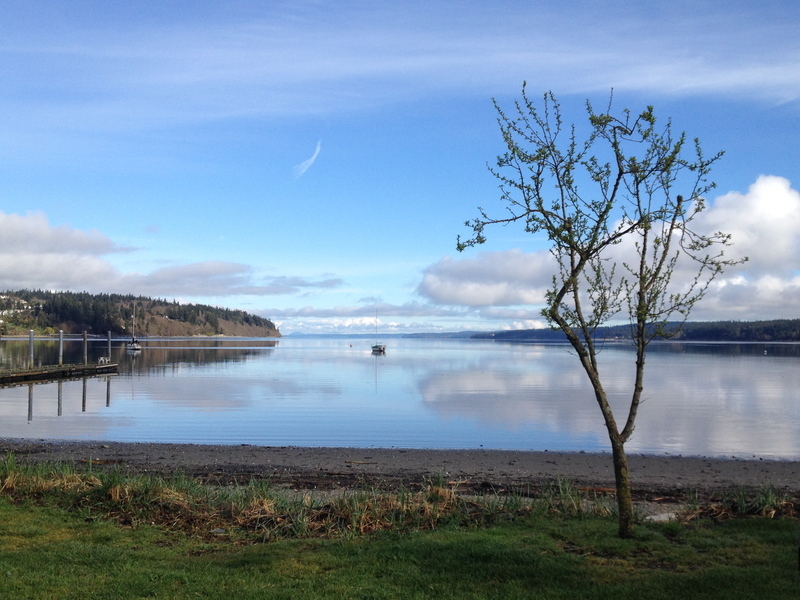 It was supposed to take eight weeks, but Island County displayed its usual capacity for delay. I wrote the county commissioners an angry letter last week, but haven’t had a reply and don’t expect one. I imagine they’ll just file it in the grumpy-homeowner file. It has been two years and two months since we first applied for the wetlands permit. Robin wields the shovel. Her hands are red from cinnabar. Next week the surveyor will mark the location of the house, and later in the week clearing of the site will begin. We are beyond excited to have construction finally under way. Our contractor says his crews build year round and are used to working in the rain and cold. The thing the weather seems most likely to affect is pouring the concrete. Just don’t watch “Mr. Blandings Builds His Dream House” if it shows up on Turner Classic Movies.